Please see below a note from Eloise Jennings in regards to our first family mass on Saturday 19th March 2016. This will be the first of our ‘Family’ Masses hosted by a different class, commencing fittingly with the new leaders of our school – Year 6 students. A note will be sent home with the children tomorrow, please complete advising if your child can attend and how they might like to participate and return to school by next Wednesday. This year I am lucky enough to be working with the Year 6's for science. We have started our Biological Science unit examining mold and yeast and I am sure there have been some Blue Cheese stories! After a quick magic lesson to discuss the Scientific Method and changing only one variable at a time, we began examining yeast, the conditions for growth and how we use it. As part of our investigation we are making ginger beer and will need a number of bottles to brew this in. If you have any clean, spare 1.25 litre cool drink bottles with lids, please send them in. 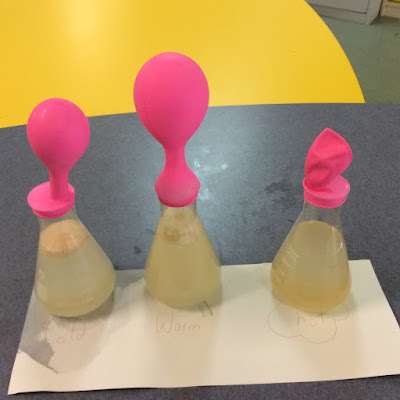 The photos below show the two experiments that we conducted to investigate the conditions in which yeast grows best. We will be discussing these results and what they mean next week. Welcome to Week 5...it has been such a busy term and the students have been handling themselves brilliantly. I am very impressed with the mature and responsible ways in which they are conducting themselves. 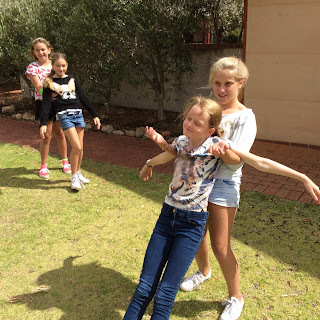 Leadership Retreat - We enjoyed a fantastic day with Mrs Sue Barton who ran our Leadership Retreat on Wednesday. 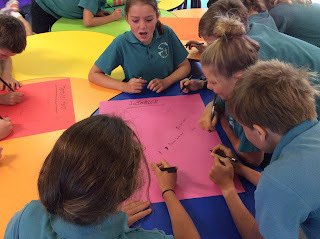 The students found the activities interesting and engaging and could see the connection to situations at school in which they could act as a leader. Sue played the students the song "Man in the Mirror" by Michael Jackson which acted as a great reflection opportunity for the students. We have had the song playing a few times in class now...it seems to have become our anthem! There was a wide range of activities undertaken by the students in which they had a chance to show their personal leadership as well as enjoy the leadership of others. Welcome to what is shaping up to be a very busy week 4! Just a couple of reminders about some important things coming up this week and beyond. Thank you for all that you have done to support the students through the last couple of weeks with swimming! Swimming Time Trials - we will be travelling to Geographe Leisure Centre on Tuesday 23rd February to complete our time trials which will facilitate the students being placed in the appropriate division. We will be leaving school promptly at 8.50am so if you can make sure that your child is dressed in their sports uniform with bathers/rashie and thongs on, (sneakers are to be brought so that students can put them on upon their arrival back at school). Please make sure that your child has applied sunscreen before coming to school, I will also take some with me. Please see the pink note that was sent home by Mrs Sinclair on Friday for further details. These permission slips need to be returned by tomorrow. Leavers Shirts - Please send in your child's shirt with their name on it by Friday 26th February. The sooner that we have all the shirts in the sooner we can get them to Hip Pocket to begin the printing. Camp - Thank you to those parents that have responded to the call for help during our camp week. I have had a large number of dads say that they are keen to come but I am in need of a mum or two to assist. If you are able to come with us for some or all of the week, please let me know. Parent Information Evening - Thank you for your attendance at our meeting last week. For those parents that were unable to make it, I sent home the information booklet with your child on Friday. Please let me know if you have any questions. The students will design and then vote on a piece of art for the shirt which will appear with our school crest on the front, and “Graduates 2016” along with our chosen artwork and student names on the back. You can provide a clean and tidy polo shirt that your child may already have.You can purchase a new polo shirt from the uniform shop. Please send your child’s shirt with their name already written on it to class by Friday 26th February. The total cost for the work to be done on the shirts is $12.00 each. Can you please put the exact money in an envelope with your child’s name on it and give it to me during gathering time. Alternatively, you can also pay via EFTPOS through the office. This amount will need to be paid by Friday 26th February. On Friday we celebrated the announcement of our leaders for 2016. Badges were presented to our Head Boy Zac Beers and Head Girl Molly Greaves as well as our Deputy Head Boy Lyndon Pritchard and Deputy Head Girl Polly Higgins. 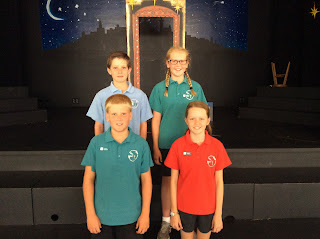 Congratulations to the following students for being elected Sports Captains for 2016. Congratulations to you all, we are sure that you will do an amazing job! There has been an occurrence of head lice in your child’s class/area. As a Year 6 Leadership Group, we have been offered the opportunity for Mrs Sue Barton to come in and run a half day workshop with the students that will help them to explore the concept of leadership, what it means to them and how they can contribute in a leadership role for 2016. This will be held on Wednesday 24th February beginning at 9am and concluding at approximately 1.30pm. This will be held in the Hall here at school. We would like to have a shared lunch on this day to conclude the workshop and I am looking for a parent to volunteer to coordinate the shared lunch leading up to and on the day. Lunch would be served at approximately 12.30pm. Thank you for a fantastic start to the term...we have hit the ground running and I am very impressed with the mature and positive attitude that the students have brought to the year.Thank you for all that you have done to get them ready for the school year. Our spelling and writing work has kicked off in well with looking at how important it is to focus on the correct spelling of given words. We have also had some fantastic conversations about how to write a 'GOOD' narrative. We have looked at the structure and language features of a narrative and the students are very excited about the work to come. We are reading the novel Rowan of Rin by Emily Rodda and the students are loving the themes that we are drawing out. We have looked at the importance of the Visualising strategy to help us to comprehend what we are reading.